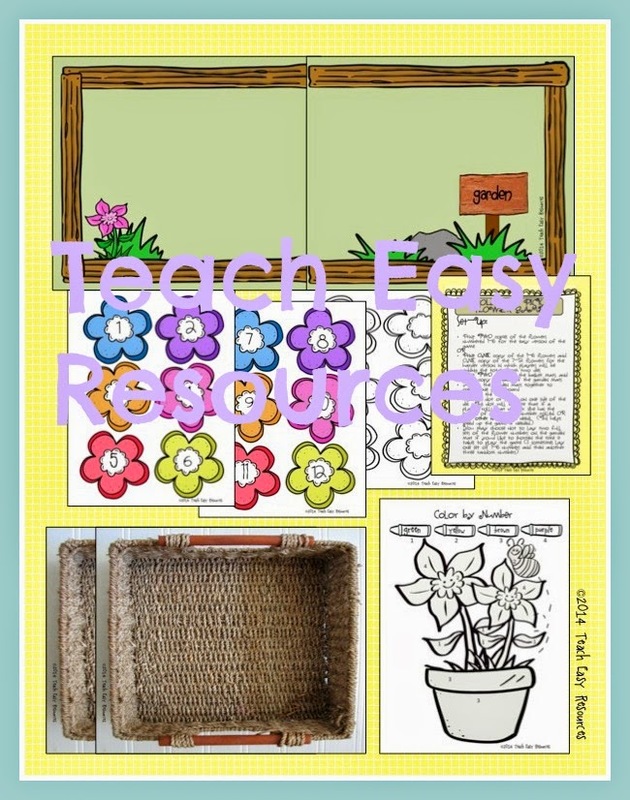 Teach Easy Resources: Like to Garden? Take a Peek at these Great Center Time Activities Idea for Spring! I think a big part of what makes spring special (for ME, anyway!) is seeing all the flowers come to life. The world goes from gray, gray, gray to a canvas filled with pinks and purples and yellows...! Everywhere you look - colour and new life. And of course there's finally some SUN to go along "with"! This weekend I was out in my own garden getting my raspberry beds weeded. I DO NOT like weeding, but I do love raspberries so I do the work! 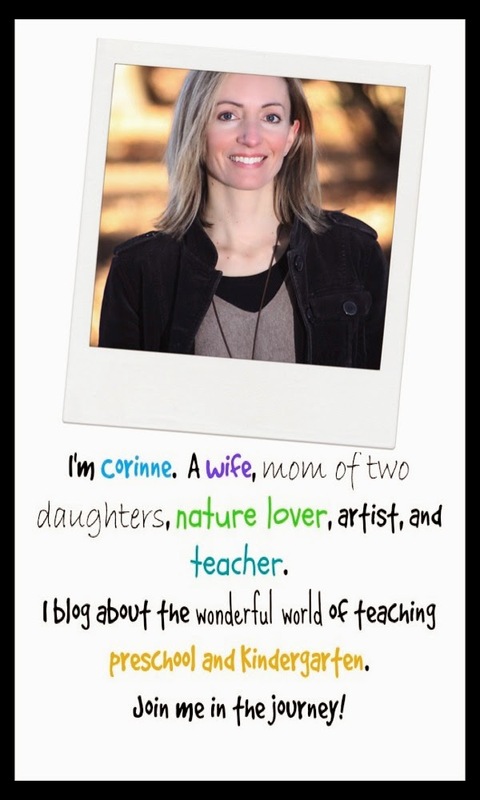 I like to celebrate this time of year in my classroom by planting some real flowers with the kids, as well as bringing in some fun spring flower games and activities. The students get to make flower arrangements, wrap them in tissue paper OR place them in a plastic vase, add note cards, take phone calls, and "deliver" the flowers to the customers. They can also keep the shop organized by placing flowers into vases labelled with the correct flower names. The flower shop is a busy place! For those customers who want a specific arrangement, bouquets can be ordered using an erasable marker on one of four unique order forms. Shopkeeper: "Would you like roses? Here's your order form. Just circle the number and colour of roses you would like, and I'll have that order ready right away!" 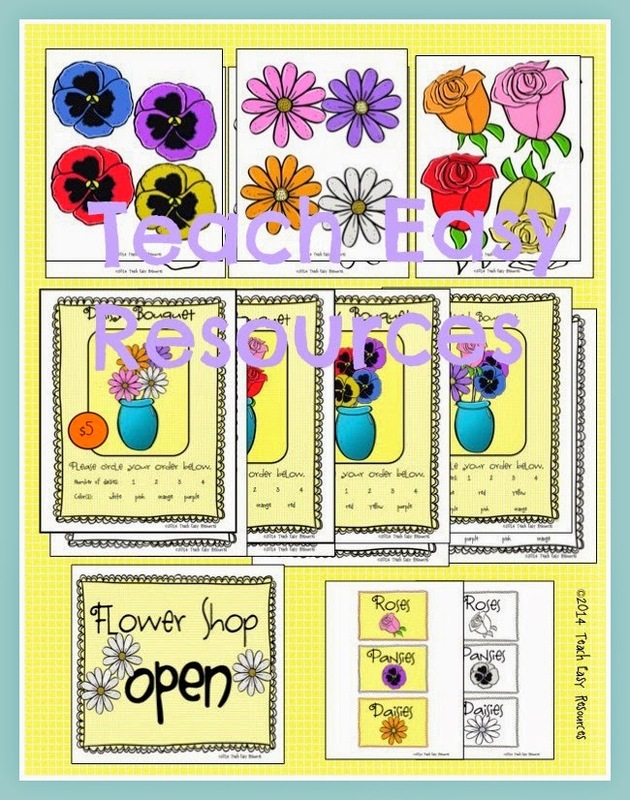 Here is the collection of flowers, labels, and order forms I created to set up our classroom flower shop. To set up the flower shop, I just added green popsicle sticks to the back of the flower images to create "stems," attached the flower labels to some plastic "vases" (icing containers work great!) and I was ready for business. Once I posted my "OPEN" sign, the customers started rolling in! To encourage the children to practise counting and number recognition, I also created the 2-person game below to go with this flower theme. Players place the flower images on the garden mat and roll the die to see which flower they should pick up. In preschool, we use this game to practise number recognition (both in terms of recognizing the number on the "dotted" die, as well as reading the numeral on the flower), but this game can also be made more challenging for Kindergarten students. 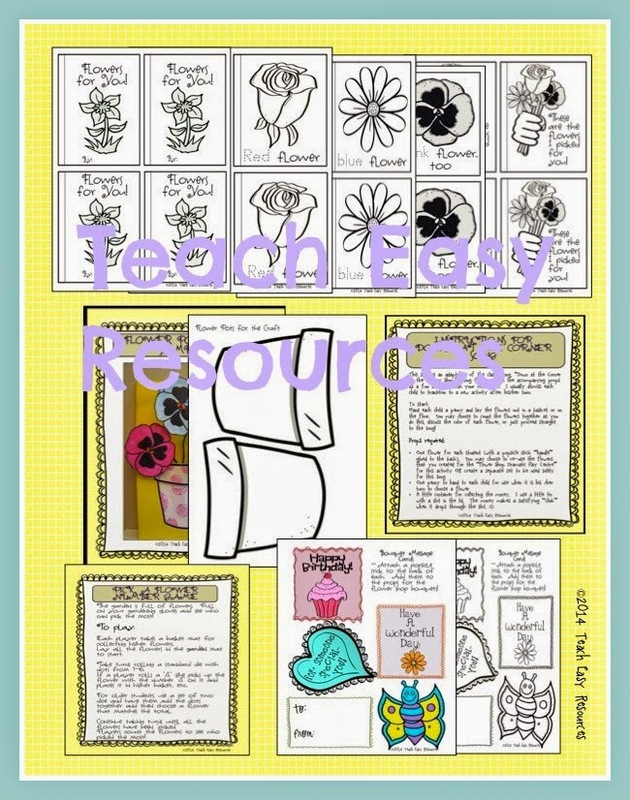 Older students can use two dies and then choose the flower that matches the sum of their roll. Players finish the game by counting the flowers to see who "picked" the most! Our class also loves to do mini-books. You can see the mini-book that I created for this unit at the top of the collage below. Other activities in this unit include a colour by number page, a 3D art project, and a fun circle time song and activity. 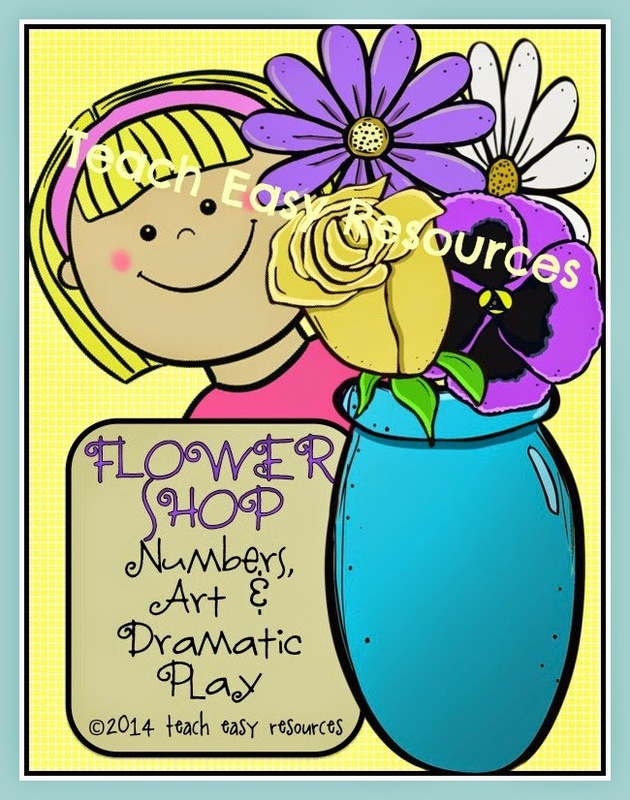 This Flower Shop Unit is a total of 43 pages of fun and I'm currently offering it for $4.95 in my shop. Keep your kids engaged with this seasonal unit and save yourself some valuable TIME as you deal with all the details of wrapping up the school year.